An encounter with the most brilliant pioneers of the industrial age. Recreating their stories of burning ambition, extravagant dreams, passion and rivalry as great minds clashed, this programme delves into the history of seven epic monuments spanning the industrial revolution. 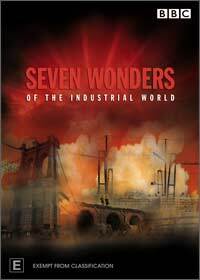 Using spectacular CGI, the seven stories that are revealed here are: the SS Great Eastern; the London sewer systems; the Bell Rock Lighthouse; the US Transcontinental Railway; the Panama Canal; the Hoover Dam; and the Brooklyn Bridge. Another winner for the BBC. Writing excellent, production values high, good special effects. Thing that I got from the series was what these Engineers had in bucket loads was ambition. Not necessarily for there own fame and fortune (though if that came then so be it), but for the project. To build a sewage system for London, build the Panama Canal or build a Railway across America needed that ambition and drive. Every episode left me feeling humble; we have technology, which these engineers could have scarcely imagined. But somewhere along the line we have lost that ambition. To see what could be achieved with primitive technology, human toil, imagination and ambition makes me wonder what could be achieved today if we put our mind to it. I would recommend this to anybody has a passing interest or uses technology. Watch this and you will feel humble.